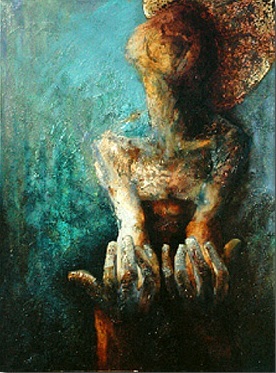 The paintings of Canadian artist Wojceich Macherzynski are characterized by exceptional emotional strength. The images are arresting and powerful and often full of tension. These are works that are neither pretty nor comfortable. Macherzynski’s work puts one in mind of the distinction made by the Reformation theologian Martin Luther between theology of the cross and theology of glory. The latter drew knowledge of God through nature and human speculation while the former recognizes God precisely where he is hidden - in his suffering. Luther had little patience for the theology of glory which serves only to inflate human ego. 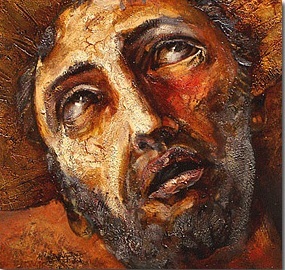 God is known only in suffering – both the suffering Christ and suffering humanity for, he said, only the sufferer can enter into community with God. Humanity depicted here is not trapped in the difficult and painful realities of life, there are hints that there is a way through. There is strain and burden to be sure – but it is strain and burden accompanied by a longing for “paradise” and belief in a salvation that will deliver us from this present darkness and bring us to a new place. We discern in this work humanity bent under the weight of life but still able to look not just at the moment but ahead to what is to come. This is art with a hint of promise suggesting that what confronts us now is a passing moment of a much bigger journey. This artist is not blinded by the many modern examples of human achievement but seems to be moved by widespread and profound moral failure evident in our global and local communities. These paintings counter any inclination to self congratulation and call us instead to a more humble and contrite spirit. In some of these images the figures reside on the threshold between reality and unreality. We are not sure whether the figure is emerging or disappearing but the sense of presence is nonetheless striking. Macherzynski does not paint individuals – specific persons with their own unique qualities. Instead he paints icons of humanity, figures which transcend private individuality and offer us a vision of much larger scope.The figures are often out of focus not unlike life itself suggesting openness to mystery, mystery about ourselves and mystery about life and the journey we are on. light and dark in the painting leaves us with the impression that there is more here than meets the eye. These are bold paintings executed by an artist with deep passion and an exceptional artistic gift. They are works inspired by acute sensitivity to the human condition coupled with a strong and sustaining faith. They do what art is supposed to do – provoke our reflection, raise questions and move us to see with fresh perspective. From the catalogue for Conquest of Paradise – John Franklin – Executive Director Imago, Toronto, ON.